The video shows Raghubar Das, 62, riding a white scooter along with a pillion rider who too is not wearing a helmet. The Jharkhand Chief Minister is seen leading a group of two-wheeler riders through the Ranchi's streets. Jharkhand Chief Minister Raghubar Das was seen riding a scooter without wearing a helmet. 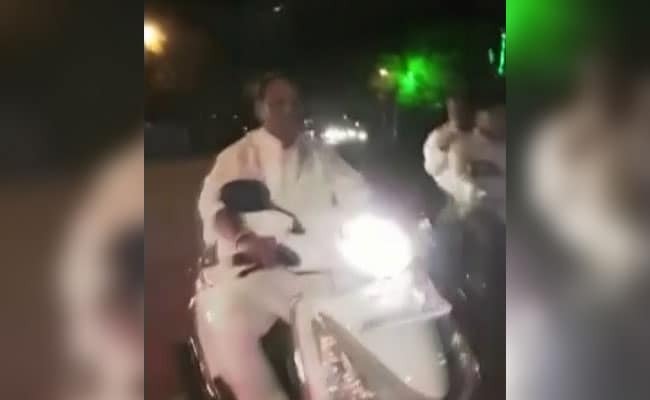 Jharkhand Chief Minister Raghubar Das was on Thursday night seen riding a scooter in the state capital of Ranchi. Taking a Diwali night spin of the town with his supporters on other scooters, the Chief Minister was seen without a helmet. The video, released by news agency ANI, shows Mr Das, 62, riding a white scooter along with a pillion rider who too is not wearing a helmet. Mr Das is seen leading a group of two-wheeler riders through the town's streets. On Diwali, he had tweeted Diwali greetings along with a photo of him offering prayers. Congress leader from the state Subodh Kant Sahay said police action should be taken against the Chief Minister. "I have always believed that there is no harmony in the words and actions of Jharkhand CM," he said. In July, a video showing two women washing the feet of Raghubar Das at an event to mark Guru Purnima had gone viral. He took charge as the first non-tribal Chief Minister of Jharkhand in December 2014 after the BJP and the All Jharkhand Students Union (AJSU) won the state polls.